Malaria is the world’s most devastating vector-borne parasitic disease, causing 0.65–1.2 million deaths per annum. Anopheles gambiae is the principal vector for malaria in Sub-Saharan Africa, where 90% of casualties occur. A. gambiae thioester-containing protein 1 (TEP1) is a major factor in the natural immunity of mosquitoes to malaria, targeting Plasmodium parasites after their traversal of the midgut epithelium. Hence, a better understanding of mechanism of TEP1 will further the goal of preventing malaria transmission. TEP1 has both structural and functional homology to complement factor C3, but a key domain in the regulation of complement, the anaphylatoxin domain, is absent. 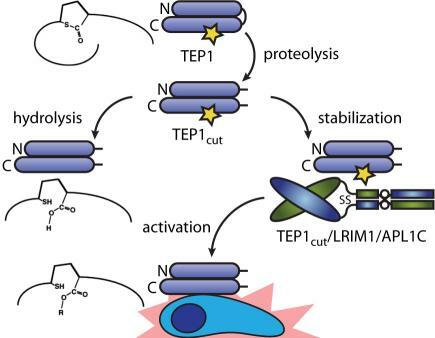 Hence, the molecular mechanism of TEP1 activation is distinct from that of vertebrate complement factors and is currently unexplored. We are currently focused on the molecular determinants of TEP1 activity, including (i) the rate and reversibility of nucleophilic attack of the thioester, (ii) structure-function analysis of the protein-protein interface containing the thioester, and (iii) the changes in interactions and dynamics that form an active TEP1 complex. While Anopheles gambiae thioester-containing protein 1 (TEP1), has many similarities to complement C3 it lacks a key feature, the anaphylatoxin (C3a) domain. 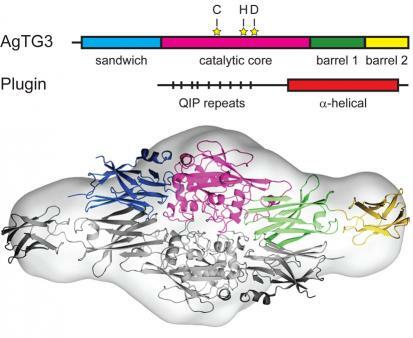 Rather, TEP1 interacts with a heterodimeric complex of the leucine-rich repeat (LRR) proteins LRIM1 and either APL1A, APL1B or APL1C, which are members of a diverse, structurally distinct and mosquito-specific LRR family. The molecular basis of this regulation represents not only of fundamental interest to the comparative immunology of complement, but has practical significance due to the role of TEP1 in the natural immunity of A. gambiae to Plasmodium infection. We are interested in key structural and functional aspects of the LRIM1/APL1 family. 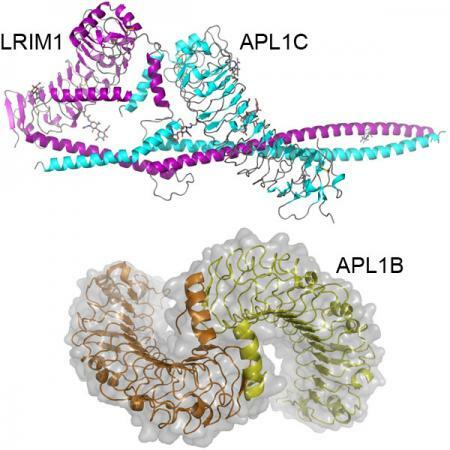 First, are exploring how structural differences between APL1A, APL1B and APL1C influence their interaction with each other, with LRIM1 and with TEP1. Second, we are analyzing the affinity and stability of the LRIM1/APL1C complex with TEP1 and interactions with a family of serine protease homologs that control downstream effector mechanisms. Finally, we are pursuing the structure of the TEP1/LRIM1/APL1C ternary complex to better understand how LRIM1/APL1C regulates TEP1 function. Thioester-containing proteins (TEPs) are a superfamily of large (>100 kDa), secreted proteins that play central roles in the innate immune response of animals. Two types of TEPs – complement factors and α2-macroglobulins (A2M) – have been studied extensively. Arthropods have two extra classes: insect TEPs and macroglobulin/complement-related proteins (MCR). The structure and function of these TEPs is of fundamental significance to developmental and comparative immunology. It is also important to (i) understanding the transmission of animal diseases, (ii) developing new strategies for pest control, and (iii) reducing the effects of environmental chemicals and habitat change on beneficial insects. Yet A. gambiae TEP1 is currently the only invertebrate TEP of known structure. Despite their central importance to the immune system of all insects, the structure, function and regulation of TEPs in other insects are almost entirely unknown. Moreover, we know that the regulation of TEP-mediated immunity is different in insects other than mosquitoes, as the LRIM1/APL1 proteins responsible for regulating A.gambia TEP1 are unique to mosquito genomes. For most insects and arachnids it is not known which of their TEPs are complement-like, A2M-like, or have unique functional properties. We are working to determine the general rules that relate structure to function for all TEPs, by studying new TEPs from the fruit fly Drosophila melanogaster and the hard tick Ixodes ricinus. A general understanding the structure-function relationship for different TEPs will allow us to predict the function of specific TEPs in all insects. We can then better predict the effect of disrupting TEP function in both beneficial and pest species of insects. We may thereby identify targets for developing insecticides or insect growth regulators that are more specific and/or less toxic to non-target species, including humans. Vector control is the most generally effective method of malaria control. Measures such as insecticide-treated bed nets and indoor residual insecticide spraying dramatically reduce the malaria burden. These control measures are jeopardized by increasing insecticide resistance in mosquitoes. An alternative approach to insect control is to target fertility, known as the sterile insect technique (SIT). Yet SIT has not been deployed for malaria control due to logistical difficulties. Mosquito chemosterilants were extensively tested in the 1960s and 1970s and found effective for SIT, but lack of specificity and environmental concerns prevented their deployment. Our initial focus in this area is the transglutaminase AgTG3, a male-specific enzyme that crosslinks a substrate, Plugin, forming a ‘mating plug’ that A. gambiae males insert into females, ensuring proper sperm storage. Our approach aims to develop useful chemical probes to study the role of the mating plug formation in A. gambiae reproduction. There are numerous proteins of unknown function in mosquito seminal fluids that are potential targets for the safe and specific chemosterilants. An ideal target is a male-specific enzyme crucial for mating in all mosquitoes. We are simultaneously extending our study of tranglutaminases to other Anopheles and Drosophila transglutaminases, which are involved in wound-induced immune responses such as hemolymph coagulation. Drosophila transglutaminase was recently shown to modulate mucosal immune responses to the gut microbiota, and A. gambiae TG2 is reportedly involved in responses to Plasmodium infection. A possible application of insect transglutaminase inhibitors is as immunosuppressants, a type of slow-acting insecticide. Vancomycin, teicoplanin, and related glycopeptide antibiotics their relatives are important antibiotics. However, the onset of resistance motivates the development of new synthetic routes to selectively manipulate the scaffold. The Miller Laboratory has developed a set of specific peptide catalysts to selectively phosphorylate the primary hydroxyl on each of the three glycans in the molecule. 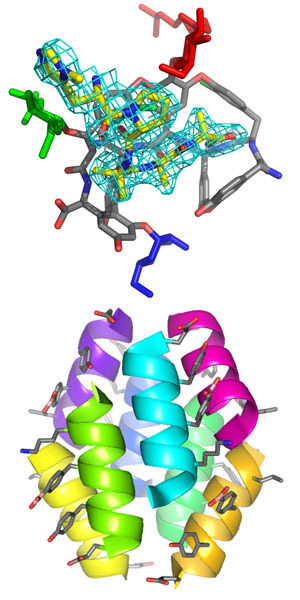 Using a carrier protein approach, we have determined the structure of a peptide catalyst that specifically phosphorylates the N-acetylglucosamine C6 hydroxyl of teicoplanin A2-2. The structure is different from the original prediction, but the catalytic histidine is indeed directed towards the sugar it phosphorylates. More generally, this approach provides a basis for developing future catalysts to produce new teicoplanin derivatives as potential therapeutics. Macrophage migration inhibitory factor (MIF) is regarded as a major regulator of inflammation and a key mediator that counter-regulates the inhibitory effects of glucocorticoids within the immune system. It is also an anticancer target. The Jorgensen laboratory (Yale) has developed highly potent MIF inhibitors using in silico prediction. We have determined structures for several such inhibitors in complex with MIF. The synthesis of new inhibitors based on these structures is underway. Besides the potential use of such compounds as anticancer drugs, this approach may be useful as chemical probes or therapeutics for pathogens that use MIF homologs to modulate host immunity. The Scheppartz laboratory has previously determined the structure of ‘protein-like’ β-peptide bundles that spontaneously assemble into a stable tertiary fold. Moving beyond structure to function requires the design of a selective binding functionality. We have assisted in the structural analysis of a new octameric bundle comprising a phenylboronic acid moiety to bind polyols such as saccharides and dopamine. We are continuing to assisting the Scheppartz laboratory in crystallizing and determining the structure of a novel β-peptide bundles.